In 1979, a year after graduating from art school in Boston, I took a job at the Duplex Nursing Home, where I worked for a couple of years as an activities director. There I found not only a rich pool of potential friends, but also recognition of something in myself: a long-standing interest in capturing, through the written word, the character of a person—in particular elders. Oral history has a valuable place in our culture, but that isn't what I'm looking for. I don't see old people as merely windows on their past. No matter how much I’m told about events that predate my life, I'll never be able to go there. On the other hand I do hope to grow old. Most of the important decisions we make about our lives, from career choices to whether or not to have a family, are made from observing what other people do in these situations. When it comes to aging, our glimpses of the process are primarily limited to watching family members grow old. Witnessing the aging and decline in older generations can't help but draw attention to one's own mortality. Furthermore, having known these elders over the course of an entire lifetime, it's hard not to mourn the loss of who they used to be. I can trace my interest in befriending elders back to a trip I made to Palm Springs in the mid-seventies where my grandmother would spend the winters with her elder sister. This visit was notable because of time spent with her neighbor, Herb Feitler. Herb and Hannah Feitler had been childhood friends of my grandmother. During my time there, Herb and I made several excursions into the surrounding desert communities, mostly stopping at flea markets. I was in my mid-twenties, and to me, hanging out, driving around and becoming friends with a guy in his late seventies was the height of exotica. He wore one of those cloth fishing hats that I associate with Jack Klugman, Norman Lear or Woody Allen. Herb was authentically who he was and that simply connected with me. When I returned home to Boston, Herb and I stayed in touch through occasional letters and postcards. Though I didn't recognize it at the time, what was so striking to me about meeting Herb was that I never knew him before. I had no familial connections or past history with him. Unanticipated and unforeseen, our friendship was borne out of a chance confluence. He was an engaging contrast to my grandmother, with whom I had a clearly delineated (and ultimately rather limited) relationship, based solely on the grandmother-grandson dynamic. Herb became my friend. I moved to upstate New York from Boston twenty-two years ago. The Duplex Nursing Home has long since closed its doors. As with any of my friendships, with the passing of time (especially if they're no longer living) many of those residents show up in my dreams. What began as an interest has become my life's work. I set aside the brushes and canvases that had been my focus before, during and briefly after college. I found my voice as an artist, in a different medium. Words fit me like a better-tailored suit. 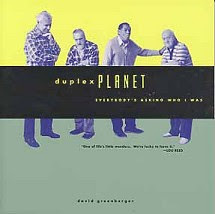 First I created a little magazine called The Duplex Planet, and subsequently book collections, a comic book adaptation, CDs and performances, all based on my relationships and conversations with a range of elderly people. My Washington County neighbors and trips to other parts of the country are now the source for my work and ongoing friendships. We already know the obvious things that old people have in common with each other; I want to know what makes them individuals. The more people I meet, the more different they seem from each other. Amid all these differences there is room for us all.